Copyright © 2002 John H. Betts - This image is copyrighted. Unauthorized reproduction prohibited. Brilliant crystal cluster (hard to photograph!) 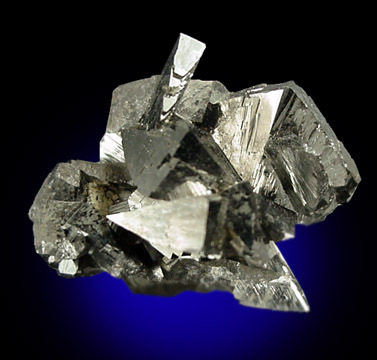 of metallic arsenopyrite crystals. The crystals are exceptionally brilliant luster - the best I have ever seen from this locale. No damage. Mounted in plastic display box for protection. Overall size of mineral specimen: 25x22x20 mm. Size of individual crystals: 5-10 mm.